Begin with the average boardroom of any major company in corporate America, and you’ll likely find a group of very like minded individuals, despite their genuine attempts at diversity. ‘Group think’ is one of the biggest threats to innovation, and yet these same minded groups are wondering why they struggle to innovate. Add Mums, who are estimated to account for ~ 80% of the household spend on everything from vacations to clothing, and domestic appliances to technology. Shockingly, that percentage is nominally represented in the majority of the boardrooms that I have seen. Stir in Millennials and Gen Z – which is to say, generations that are far more engaged with purpose than profit. Legacy brands that are traditionally focused on quarterly results rather than what they stand for are left struggling to maintain relevance not only as producers of goods and services but also as employers, as the core values of these powerhouse generations are not resonated with traditional corporate culture. Bake in the amount of money it costs an employer to hire a full-time employee. Some estimates put the incremental costs of hiring someone in a full time role as high as 85% on the dollar, with pensions, office rent, 401k’s, medical insurance, company benefits etc. Mix in legacy brands, beloved companies we’ve all grown up with and until recently, have always considered unassailable. Many of these brands are currently facing extinction because their legacy systems and cultures aren’t equipped to think and act like start ups, enabling them to act quickly enough to survive. 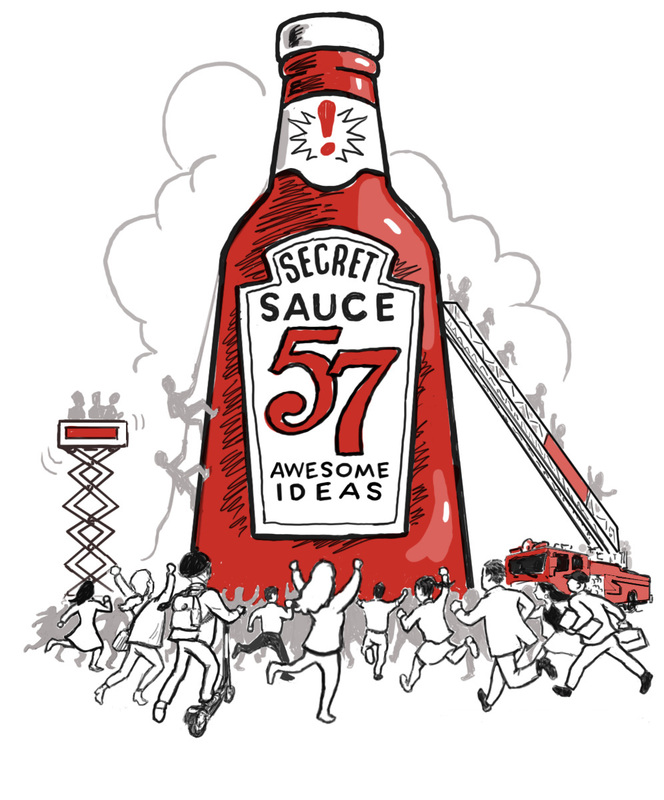 Pour in the secret sauce – Crowd Sourcing, or even a splash of open source innovation, and sit back and let the idea juices (bake) together. Mild – a low entry example would be Apple’s iPhone, a brilliant example of open source innovation. Apple simply piloted the first model when it wasn’t yet perfect, and continuously learned from their mistakes and opportunities as they developed and piloted version after version, which have effectively delivered the very wants and needs of their consumers. Medium – enter Disney’s Magic band, which is given to most guests visiting Walt Disney World on vacation, allowing them to avoid standing in lines in return for big data (on steroids), effectively measuring visitors’ likes and dislikes minute-by-minute (via purchase and geo-tracking) to offer unprecedented behavioural insights and thus to inform all future products and services Disney will design. Spicy – an Accelerator Program, where companies invite a series of startups to assist in solving a given challenge. The top solutions are then reviewed by senior executives, Shark Tank style, and are then provided a team of internal catalysts who build business pro formas around each concept as the last precursor before taking the concepts to market. This model only works if the corporate enterprise is willing to relinquish some level of control, and where work product ownership and is based on mutual trust. Sizzling crowd “saucing” is by open source innovation, which proactively invites a community to help solve a set challenge by submitting their own proposals against a given brief. A perfect opportunity for this type of open source innovation was the London 2012 Olympic Games, when the British Olympic committee briefed a creative agency to develop a logo for the games. The day the logo was unveiled it was met with widespread condemnation and a dash of British humor, to say the least. In the few days that followed consumers barraged the internet with their ideas for what the 2012 logo could look like, with several significantly more iconic designs. There was a real opportunity for the British Olympic committee to overcome the consumer sentiment that the Olympics are only for the elite who can afford the tickets at the burden of the taxpayer, and turn that perception into this is “our games,” by having crowd sourced the logos submitted to them, and then making an informed decision by popular choice. Serve – While there are obvious challenges to overcome in terms of Intellectual Property concerns, I believe that too many people leverage this perceived barrier as a cover, when what they are really worried about is that someone’s better idea is a threat to their position. The crowd “saucing” model only borrows from mom’s recipe for “Common Sense.” … actively listen to your consumers and anticipate their needs and wants before your competitors beat you to it.